Sober Look: BNP Paribas: Japan's fiscal problems could be reaching a "critical mass"
BNP Paribas: Japan's fiscal problems could be reaching a "critical mass"
BNP Pribas is once again ringing the alarm bells on Japan. 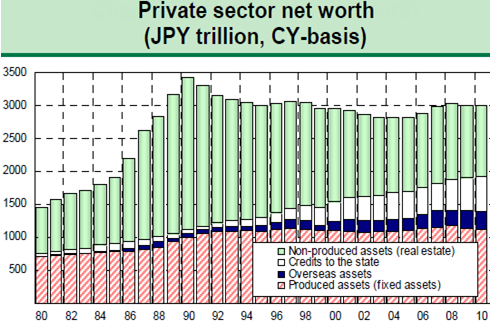 They show that the Japanese government bonds are becoming an increasing part of the private sector net worth. 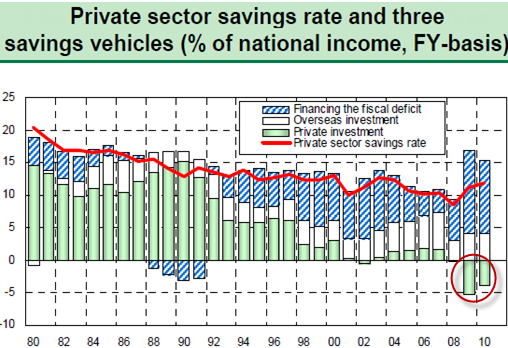 In fact the bulk of high private sector savings, which Japan is known for, now goes to finance the fiscal deficit. Government bonds are crowding out net private sector investments (which have been negative). And Japan's high savings rate will begin to decline as the population rapidly ages. BNP Paribas asks whether the crowding out of private investment indicates that the nation is closer (than most think) to the point of "critical mass", when debt levels begin to grow out of control. BNPParibas: - In this way, Japan has since the 1990s been able to finance its ballooning debt, without interest rates rising, because households and businesses have curbed investments in real assets, with their weak returns, and the money thus saved has been channeled by financial institutions toward the financing of government bonds. But financing fiscal deficits using private sector savings alone is starting to become hard. ... the abnormal situation of squeezing funds from drawing down capital stock (negative net private investment) has been observed. Could Japan be reaching its limit (critical mass)? And government policies to tackle this critical problem may be insufficient. BNPParibas: - If just one of these three variables— strong yen, deflation, subdued interest rate— were to change, a fiscal meltdown could ensue (a fiscal crisis would be one process for moving from “deflationary equilibrium” to normal equilibrium, and it would also be a process for fiscal adjustment). For example, dispensing with fiscal reforms in favor of policies to aggressively weaken the yen could trigger a fiscal crisis. A weak yen, moreover, would foster overseas investment, making it hard to finance government bonds because interest rates would also be rising. While a weak yen would dispel deflation, it would also make it hard to keep interest rate low. Of course, leaving things as they are right now will eventually lead to critical mass and a fiscal crisis. But with the public debt having doubled compared to ten years ago, conditions have greatly deteriorated. We must keep in mind that aggressive currency policies or monetary easing alone cannot bring an orderly resolution to Japan’s fiscal problems.